Somewhere, I saw mention about gardening in potting soil bags. This is not where I saw it, but it’s a decent explanation. Something also caught my eye about raised bed gardens for people in wheelchairs. I gave this a lot of thought, since the video was so awkward and I’m not in a wheelchair. Maybe I will be someday, we don’t know, but in the meantime, I quit gardening mid-summer for the last two years because my back and I took separate vacations. Plainly, a new idea was needed. Time for some SCIENCE! The neighbors looked so happy when I stabbed this bag with a garden spade like it owed me a ten spot. In the video above, the bags were on the ground to clear space for a future garden. I’m not doing that. Pete and I walked around garden store after garden store while he explained how he’d build me a raised bed and I explained that no, I was looking for a table. Bed. Table. Bed Table. Yes, that’s how married people think. But this is all for SCIENCE! – you remember SCIENCE! This is a song about SCIENCE! – so we slapped a bag of potting soil on a disintegrating picnic table and I planted mesclun green seeds into small holes without attracting the attention of either squirrels or the local gendarmerie. The picture represents a good result. Squirrels left this – and only this – part of the garden alone. We have plenty of lettuce for the next week or so. 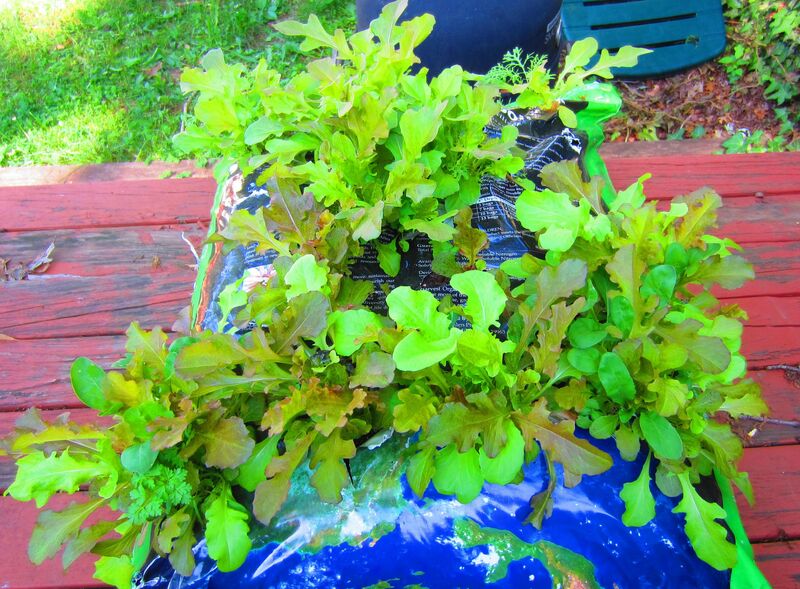 We can let these lettuces go to bolt, pull them up and plant a next course of lettuces in these bags because though July is usually too hot, this spot is partially shaded. In other words, this has some true potential, but we have to figure out why the squirrels passed on the salad bar – for SCIENCE! For our current circumstances, I picture a table with 6-8 planted bags of potting soil, which at the end of each planting season, we can turn into the current raised bed, which we will gradually raise from 8″ to a more reasonable height. More SCIENCE! is in order. More potato plants may be in our theoretical future. This entry was posted in Flowers in a Frothing Green and tagged garden spade, garden store. Bookmark the permalink.